Time to make the cheese...the Homemade Cream Cheese! It's that time again...cheese making time! Afterall, cheese is one of the my main food groups. Natashya (my cheese-making partner-in-crime) and I decided we were going to try our hands at Cream Cheese this time around. One thing to be careful of when making cream cheese...well, if you've started with some other fresh cheeses...is timing. The Queso Blanco and Mozzarella (which were the last 2 I made...along with the goat cheese which never was) were different in that they were larger batches; more milk & higher temperature=more time. This process used about half the amount of liquid and half the desired temperature...so be sure to keep a close eye on the milk while heating it. I, on the other hand jumped on the computer while my milk was heating and went higher than the desired temperature (if only I could have hit the other cheese head-on like this without constant temping). So, this was a bit of an adventure for me...trying to right my initial wrong...but in the end, I was very pleased...I'm sure I cheesed. ...and feeling squeezed, I promptly sneezed and then got teased. Sorry. Dr. Seuss/Happy Gilmore moment. Homemade Cream Cheese from The Home Creamery by Kathy Farrell-Kingsley 6 c. (1 1/2 qts.) whole milk 4 c. (2 pints) heavy cream try not to use ultra-pasteurized 1 c. plain cultured yogurt those live cultures are essential...good bacteria! 1 rennet tablet I used 1 tsp. liquid rennet (this is the conversion between the two) 1/4 c. cool water (55 to 60 degrees F) salt I used Sel Gris-Velvet* Combine milk, cream and yogurt in a large pot and stir well. Warm to 100 degrees F (this is where I initially messed up and heated to 180...so, pay attention) over low heat. Check temperature with a thermometer. Remove pan from heat. Dissolve rennet tablet (or liquid rennet...hmmm...wasn't sure if I still needed the water since I had liquid form...but I used it) in the water in a small bowl. Add to warmed milk mixture, and stir thoroughly for 3 minutes. Cover and let stand for 1 to 1 1/2 hours or until curds are firm and break away fro sides of the pan. The temperature should drop no lower than 85 degrees F (which wasn't a problem for me since I was already way up there). If it does drop below 85, slowly reheat to correct temperature. Cut curd into 2" cubes okay seriously, I had nothing to cut. I don't know if it was due to initially heating it too high or using liquid rennet and water or something completely unrelated. Let stand 15 minutes undisturbed ooooo-kay. Line colander with a double layer of butter muslin (something I still haven't found. I took a tip from Natashya and lined with a clean, used-only-for -this-purpose, white cotton cloth.) Pour, ladle or spoon (I had no choice but to pour) the mixture into the lined strainer. 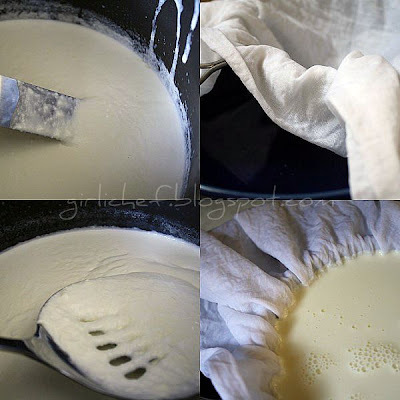 Fold the excess cloth over the curds and set the colander in a large bowl Cover the bowl and refrigerate to drain 8 hours or overnight. This is what I had the next day...an extremely wet mass. Okay, I don't think my cotton cloth allowed it to drain very well; the weave must have been too tight. So, at this point, the recipe says to... Transfer the drained cheese to a clean bowl, season to taste with salt, and stir well. The cheese is now ready to be used in flavored cheese spreads or for cooking. Unless you're me...so, if you're me, you would go ahead and transfer your wet mass to a bowl and season with some delicious Sel Gris-Velvet Sea Salt and then re-line your colander with cheese cloth this time...bigger holes for the whey to drain. Then put it back in fridge overnight...or 2 nights if you're really busy that day in between. Much thicker. Still Creamy, but YUM! Now, use as you would any cream cheese...although it is way creamier and the flavor is so insanely out of this world delicious! I had just been to the Mexican Bakery that morning to get some fresh from the oven bolillo's...I shmeared the homemade creamier-than-creamy cream cheese on the soft, warm bread and proceeded to moan my way through breakfast. Store cheese in an airtight container and refrigerate up to 2 weeks. And then I used some of the homemade cream cheese to make some of these.... Oh yeah, you've probably seen them around. A little blog by a semi-well-known blogger featured them a while back. More about that in the next post to come...tease....mmmm hmmmmm. *Sel Gris-Velvet is very, very similar to the Korean Bamboo Smoked Sea Salt that many of you have asked about, but is unfortunately unavailable (to me...that I know of) anymore. Sel Gris- Velvet is a whole mineral sea salt that gets its beautiful grey color from the clay that lines theh solar evaporation ponds used to produce the salt. They have full flavor without being "too salty." The high mineral content makes it naturally lower in sodium than other sea salts. It's velvety texture results from being stone ground to almost the consistency of baking flour. Order it HERE! If you head over the Living in the Kitchen with Puppies, you'll see what happened when Natashya hit the kitchen to make her cream cheese. Heather, tell me what else you can't make in your kitchen!! I just can't resist anything cheesy! Wonderful! I love the step by step photos. Did you wash the cloth in hot water first? That should take out any sizing that impedes the flow. That jalapeno popper is calling my name. Fabulous idea to add bacon. Oh Snap! That looks really good. I'm going to have to try that sometime. 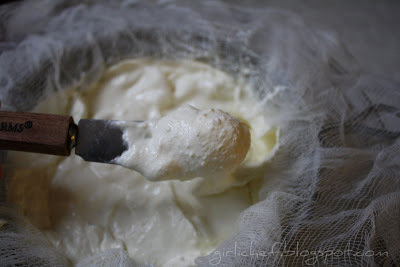 I've made my own Ricotta before (that's easy) but I enjoy cream cheese much more. Mmmm, homemade cream cheese. Cream cheese rules but it's not something I thought to make on my own. I am very impressed with your cheese making recipe. The "how to" photos are excellent. 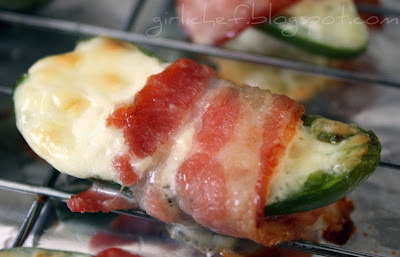 I'm salivating over that cheesy pepper wrapped in bacon. I heart cream cheese. Awesome job! You're one cheese making machine!! I'm saving this one. You impress the socks off me! Cheese-making-Rockstar! And those poppers...girl, you are bad! I am so impressed with you and Natashya! You guys rock! Great job! I'm glad it worked out. It does look really creamy and delicious! Now I'm off to the puppy kitchen to view more cheese! Both of you girls rock for making your own cheese! I bet it's incredibly delicious and worth the work. You are amazing. The best part is that you love doing all of it. Kudos kiddo! I'm so impressed (again!) - awesome job!! I'm impressed too! I've never made cheese... I might have to try it sometime! Heather, this is certainly very impressive!!! Heather- I am so impressed! Making cheese at home. Fabulous! Oh, if only I had the guts to make homemade cheese. oooooh....lovin this!! even through your extra challenges LOL....is there something we can blame on it worth while? such as merlot? LOL....but seriously...I would really love some of that cream cheese...and I really wanna make some. Where do I get rennet? I love cream cheese. I might have to try this and then make a cheesecake...OH YUM! I am flooding my friends kitchen with tears...tell me this is NOT what I missed out on...boo hoo! Oh wow! That looks just amazing. wow! i'm totally impressed! that looks amazing. i definitely want to try making my own cheese. i'd like to do ricotta! I am officially impressed. That looks amazing! Fantastic - as usual! I'm impressed by all that hard work! i just love that you make your own cheese, it looks so good! There's nothing like homemade cream cheese! This is highly impressive.. I would love just a taste!! I have GOT to stop reading your stuff so late at night, because now I want to jump up and rattle around and make stuff and it happens every time lol. Looks amazing--I am so impressed with your cheese making skills! You are sooo awesome. Your cream cheese looks totally insane. Oh, how I want this! Total AWESOMENESS!!! 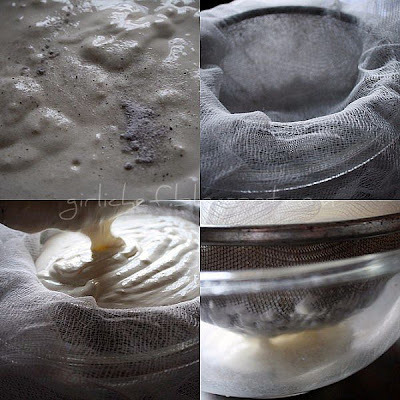 I have made mozzarella before, but I am definitely gonna have to try this next... YUM!!! Glorious Cream cheese and homemade too!!! It doesn't get much better than that (although around here one can never tell:) I would love to make my own cream cheese. I'm keeping this, honest I am, and when I make it, you will be the FIRST to know!!! Thanks for sharing!!! Those poppers look awesome too!!! I just took a cheese making class and our instructor said that she believes that the "add rennet to water" instruction was based on tablet form, so she skips the water with liquid rennet. FWIW. I am impressed that you persevered when things looked dicey--it was inspiring! Now I will have to try cream cheese! I Wilkerson...really? 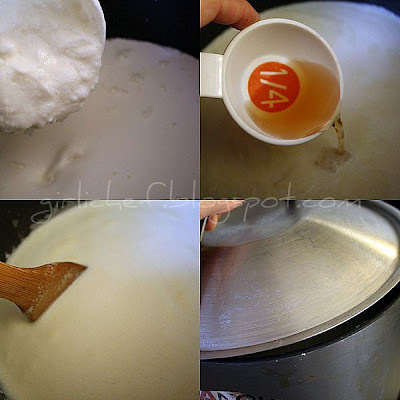 I'm not sure, but since I've been making cheese for a little while now, I've always found that the liquid rennet needs to be added to the cool water first, as well...helps disperse it once you are ready to add it into the milk. And maybe dilutes it a bit? I've found that in every type I've made with rennet thus far. That said...I've never tried it without doing it, so I don't know how much difference it actually makes. ha! 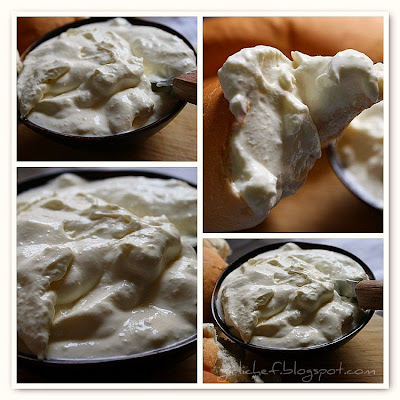 Definitely try cream cheese...it's so rewarding...any homemade cheese is, really! 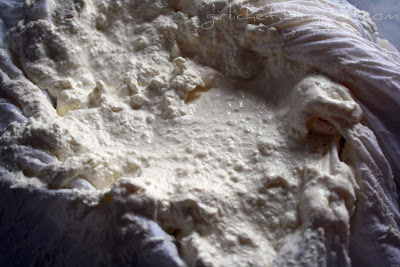 Check out my "homemade cheese" index either through sidebar or index for more Cheesing Fun!! How important is it to use whole milk? No really, I'd say pretty important. You want the fat content. But feel free to do things your own way!